The Government Plenipotentiary for Disabled People supervises execution of tasks specified by the Act of 27 August 1997 on vocational and social rehabilitation and employment of persons with disabilities. Being the Secretary of State in the office servicing the minister competent for social security, the Plenipotentiary shall be appointed and dismissed by the Prime Minister, on request of the Minister of Family, Labour and Social Policy. 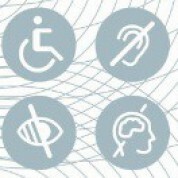 co-operation with non-governmental organizations and foundations for persons with disabilities. The Plenipotentiary performs his tasks with the aid of the Office of the Plenipotentiary, which forms a separate organizational unit in the Ministry of Family, Labour and Social Policy. Since November 2015 the post of the Government Plenipotentiary for Disabled People has been occupied by Mr. Krzysztof Michałkiewicz. The Government Plenipotentiary for Disabled People opens his office for the Open Day, each second Tuesday of the month, from 2 p.m. to 4 p.m.
Everyone wishing to meet the Plenipotentiary shall previously make an appointment by calling following numbers: 22 529 06 10, 22 529 06 09, 22 529 06 49 or sending an e-mail: sekretariat.bon@mrpips.gov.pl. The Plenipotentiary patronage or his personal participation in the committee of honor is a distinction that raises the prestige of any event or project dedicated to the persons with disabilities. The Plenipotentiary patronage or his personal participation in the committee of honor can be awarded to events or projects of international, nationwide or interregional range or coverage aiming at the vocational and social rehabilitation of persons with disabilities.